How does car excess insurance work? Car hire insurance offered by the rental car company normally includes cover for Collision Damage Waiver (CDW) and Theft, you are still liable to pay the first portion of the repair or replacement costs. This is also known as the excess or deductable. The excess amount on insurance for car hire typically ranges from between £500 and £1,600, so if your excess is £500 and someone drives into the back of you causing damage of 750, you will have to pay 500. 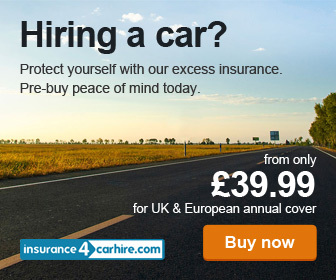 Insurance4carhire covers you against the entire excess fee and for damage to the roof and undercarriage of the car plus the windows and tyres.